Gardening is so very rewarding!! We’re blessed with plants and flowers that make us cheerful and happy everyday, like our beloved and faithful Miniature Pinscher, Maxi who uplifts our spirits endlessly with his charming ways. 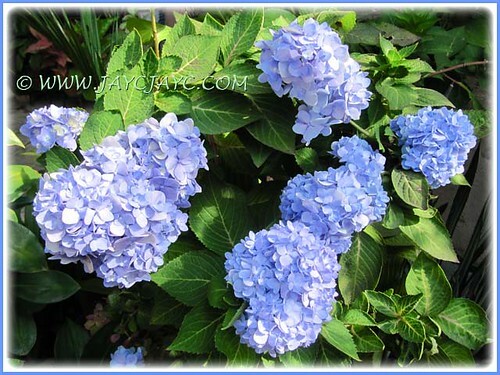 Mophead Hydrangea in blue is the starring beauty for September 2012 in our tropical garden. For the first time our gorgeous perennial plants flushed happily with many cluster of blooms, probably after being fed with organic fertilizer. We’re amazed that the plants are flowering almost at the same time to present a remarkable display! Flowers are long-lasting and turn pink or purplish-pink as they age… isn’t that great, no need to buy the pink variety? We’re thrilled that this young plant flowered for the first time since its addition to our garden last November. Its quaint-looking bird-like flowers with reddish-pink bracts are attractively beautiful and rather unique in form. A pity though that I only managed to notice and photograph them when the ‘birds’ are already off its prime colour in green. 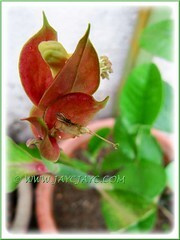 If you’re interested to see more photos of them, do click the link ‘Euphorbia bracteata’ above. 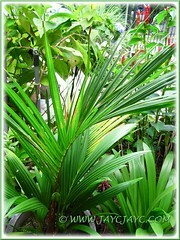 Also commonly known as Red Sealing Wax, Lipstick Palm and Rajah Palm. Aptly named in reference to its attractive and vibrant red trunks (or crownshafts) and leafstalks. We’re extremely excited that our potted Lipstick Palm had reached 1m tall currently. Hmm… such a very slow-growing palm that took almost 3 years from the time it was propagated in November 2009 to reach its current height. Nevertheless, it was just right for us to replace the White Mussaenda, though eye-catchy, it was growing too high to prune the withered white bracts that kept littering the garden bed below… quite high maintenance for us! So, my beloved John chopped it down to soil level and placed our potted Lipstick Palm on that spot. It’s not grounded to prevent it from growing too fast. Hope the pot can hold its expansion and not break it. 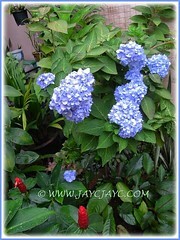 We expect that it will eventually provide shade for our Blue Hydrangeas. Unexpectedly, our beauty bloomed again in September! Unlike August, this time it emerged from another matured bulb to absorbed us in wonder, ensuring us that it’s happy and wishes to remain in our garden. So be it… currently it’s potted and located at our backyard but I’ll replant them, grounded into the garden bed at our front yard when I’m stronger, healthwise. This attractive dwarf variety with vibrant red spathe (length and width = 4-5cm ) and a yellow spadix (about 3.5cm long) was added to our home in July 2012. When the two flowers withered a couple of months later, I had it transplanted in a one-size-larger pot. Surprisingly, in mid-September I noticed the emergence of two tiny stalks, hoping that they’ll be flowers to delight us. But the plant was such a teaser, taking quite a while to display its beauty. Nonetheless, it was a joy to see a chocolate-coloured leaf and the beginning of the tiny chilli-like spathe as shown in the first image in the right collage. Fortunately it’s located at our courtyard for me to enjoy observing them and other plants therein when I do my exercises to strengthen my weakening limbs etc. caused by the ongoing chemo therapy. Hooray, I’ve completed 22 weekly sessions and have another 8 sessions to go… just waiting for all to end because when the number of chemo jabs increases, it makes me physically weaker and weaker each day. Hence the delay in publishing this post that took me about 7-9 days to draft since I’ve curtailed my online time to 1-3 hours daily. 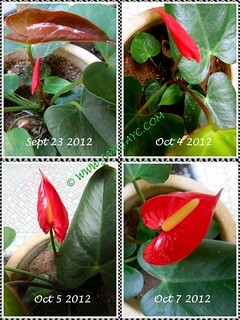 There were two more anthuriums that flowered last month to reward us too. The top image is the Dwarf Anthurium that produces very tiny light pink flowers with spathe (length and width = 2-5cm) and spadix (about 2cm long). 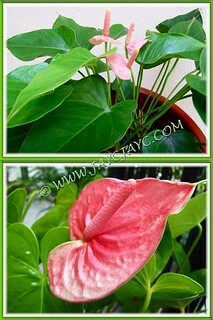 The bottom image is the standard tall-growing Anthurium that has a rosy-pink spathe (length and width = 8-9cm) and spadix about 5cm long. Flowers of Anthurium andraeanum are not only long-lasting to awe you but the plant is so fuss-free. Truly great to have them in our garden! Thanks for dropping by, A.Belle and showing your concern with your practical advice which is much appreciated. Agreed… the flowers truly warms my heart, enabling me to enjoy, rejoice and be thankful for God’s many blessings each day. The pleasure of sharing is all ours, Chellet. Thanks for dropping by and sharing your thoughts. Really enjoy seeing those beautiful blues & reds in your garden. I pray the Lord gives you strength and heals you. Continue to fight the good fight of faith and never give up. Indeed James… the wonder of watching God’s creation in marvelous ways in our garden. I am nominating you for the One Lovely Blog Award because your blog is inspirational and educational for newbie gardeners like me. Hi Chellet! Thank you so much for nominating us for the One Lovely Blog Award and your thumbs-up for our website. It is very encouraging and uplifting to receive your kind feedback.